Iditarod Names Four-Time Champ Dallas Seavey In Dog Doping Scandal : The Two-Way Under pressure from competitors, the race committee said the 30-year-old musher is under suspicion of giving his dogs the drug tramadol in this year's race. Seavey has denied any wrongdoing. Dallas Seavey poses with his lead dogs Reef (left) and Tide after finishing the Iditarod Trail Sled Dog Race in Nome, Alaska, in March 2016. Seavey denies he administered banned drugs to his dogs in this year's race and has withdrawn from the 2018 race in protest. 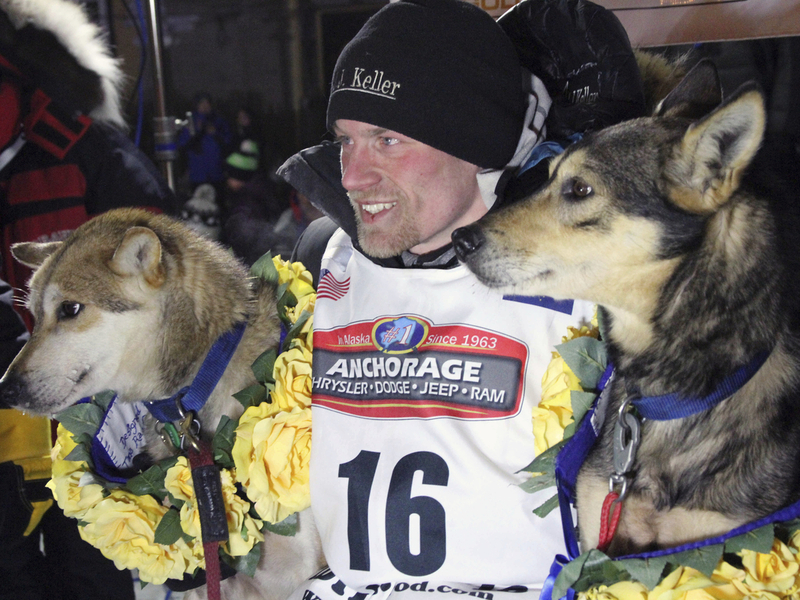 Alaska's Iditarod race committee has identified four-time champion Dallas Seavey as the musher whose dogs tested positive for a banned opioid pain reliever in this year's race. Seavey denies the charge and has withdrawn from the 2018 dog sled race in protest. Last week, the Iditarod Trail Committee announced that at the March finish in Nome this year, four dogs from a single team had tested positive for the drug tramadol. The committee initially declined to name the musher involved. However, competitors kept up pressure to release the name of the accused musher. On Monday, the Iditarod Official Finishers Club released a statement signed by 83 current and former competitors calling for the musher to be named within 72 hours, according to The Associated Press. Seavey, now 30, came in second in this year's Iditarod Trail Sled Dog Race behind his father, 57-year-old Mitch Seavey. In a YouTube video, a visibly agitated Dallas Seavey denied any wrongdoing and fired back at the race organizers, saying he had been cooperating with them to clear things up. "I did nothing wrong," Seavey said in the video. "I have never knowingly broken any race rule. I have never given any banned substance to my dogs," he said, adding that he fully expects to be banned but that he doesn't care "if I never make another cent" from the sport, which he said "is my life." He said he spent several months trying to explain how his dogs showed positive for the drug, but instead was "thrown under the bus." "I believe this was given to my dogs maliciously," he said. "That's one of the options. I think that is the most likely option. There are numerous ways that could have been done." "[T]he board said it was revising the rules on doping by shifting the burden of proof from race officials to the mushers. "In future, mushers will be held accountable for a positive test unless they can prove the drugs were administered the drug outside their control. Previously, the rule could be interpreted so that race officials would need to prove the doping was intentional, AP says."